Punit Pawar, a citizen of India, is used to going through security screening when he flies in to Logan International Airport, so he barely noticed yesterday when he was asked to put all 10 of his fingers on a digital scanner as part of an enhanced security system being rolled out at airports across the country. "It didn't take much of my time, so it didn't bother me," said Pawar, a student at Northeastern University. "I'm OK with it, if this is what they need to do for security." Since 2004, international travelers have been required to allow airport personnel to scan their two index fingers at airports as part of a program called US-VISIT. But now, foreign travelers will be asked to scan all 10 fingers, an enhancement the US Department of Homeland Security hopes will help officials more closely monitor its watch lists of suspected terrorists, criminals, and immigration violators. Logan, where two of the passenger planes involved in the Sept. 11, 2001, terrorist attacks took off, became the third airport to use 10-finger scanners last week. Dulles International Airport in Washington, D.C., began using the devices in November, while Hartsfield-Jackson Atlanta International Airport began using the new system earlier this month. Seven other airports are scheduled to start using the new system by the end of February, including: Chicago O'Hare International Airport; San Francisco International Airport; George Bush Houston Intercontinental Airport; Miami International Airport; Detroit Metropolitan Wayne County Airport; Orlando International Airport; and New York's John F. Kennedy International Airport. By the end of the year, the devices are expected to be operating in all of the nation's international airports, as well as seaports and border points. Robert Mocny, director of the US-VISIT program, said the new device scans fingerprints from travelers and within a matter of seconds matches them against more than 3.2 million fingerprints of people in FBI and Department of Defense databases. Mocny said going from two fingerprints to 10 improves matching accuracy and reduces the number of false matches. "By having this additional data, the machine will be able to say with more certainty that this is the person, this is a match," Mocny said after officials used the new scanners on international travelers arriving at Logan yesterday. Steven Farquharson, director of field operations for the Boston office of Homeland Security, said that if a traveler's prints match those in a database, the traveler will be taken to a separate area of the airport and questioned. International passengers arriving at Logan yesterday were asked to place their right four fingers, then their right thumb, their left four fingers, then their left thumb, on a small, square scanner. A camera snapped a digital photograph of their faces. Several couples traveling together completed the process in about three minutes. Pawar said he did not find the new system intrusive or time-consuming. "I don't think it was too private," he said. "I don't see any problem with it, if you haven't done anything wrong." 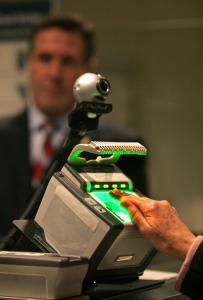 About 2,000 international passengers a day will be scanned at Logan.